The phablet comes with features like ‘Smart Assist’ for one-handed mode. NEW DELHI: In the crowded smartphone market for 5 and 5.5-inch displays, there is a dedicated space for those who love to have phablets in their digital lives. Chinese smartphone maker Lenovo recently expanded its Phab series with Phab 2 Plus which is strictly for those looking for heavy media consumption. The Rs 14,999 device is in direct contest with Xiaomi’s Mi Max that has the same specifications and price and was launched in May 2016. 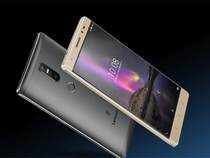 Is Lenovo better than Mi Max? Let’s find out. Phab 2 Plus has an all-metal body with a Gorilla Glass display and curvy back. The 6.44-inch display is quite immersive at maximum brightness. Even though the device offers a one-handed mode, you actually need to use both hands to work seamlessly on it. The fingerprint scanner at the back panel is very responsive. There is a hybrid SIM tray on the left and volume and power buttons at right. The striking feature that differentiates Phab 2 Plus from Mi Max is its rear dual-camera setup with LED flash. Phab 2 Plus, however, comes with the not-so-popular octa-core MediaTek processor (MT8783), 3GB of RAM and 32GB of storage. The device runs on the near-stock Android Marshmallow. In Settings, you can find features like “Smart Assist” for one-handed mode, change volume when picking up the phone and auto-answer a call. The device performed brilliant during constant gaming, long movie-watching hours or surfing. The Dolby Atmos audio is one of the striking features. The app lets you choose from multiple sound profiles. Phab 2 Plus ships with JBL earphones that deliver decent audio quality (we suggest that users consume content that has Dolby support). Lenovo Phab 2 Plus features two 13-megapixel camera sensors. Lenovo claimed that the secondary camera provides depth in a photo and it was right. The continuous autofocus works well even with video. The AR camera seems to be inspired by augmented-reality game “Pokemon Go”. Mi Max, however, scores with 4,850mAh battery. Lenovo’s 4,050mAh battery delivered nearly 19-hour backup during a marathon session of content consumption. In the loop test, the device returned four hours 39 minutes when we played two full-HD movies. Phab 2 Plus heats up easily, has a smaller battery as compared to its only competition in the Indian market and the dual-camera setup is not very impressive. Conclusion: The positives will surely make the choice difficult between Phab 2 Plus and Mi Max. If you are an audiophile, go for Phab 2 Plus. The near-stock Android is a treat. Want stories like this in your inbox? Sign up for the weekly ET Panache newsletter.